Established in 1791, Knoxville ambitiously served as capital of the Southwest Territory of the United States, and its early citizens recognized the city’s prime location as a frontier outpost with numerous possibilities for future growth and development. While a number of elements have shaped Knoxville into the dynamic city it is today, none have been as impactful as the evolution of business and industry. Regardless of the era, Knoxville has always been an ideal destination for people to start and run businesses, and it has served as the hub for a variety of progressive industries and technological advances. 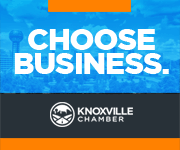 From serving as a leading wholesaling and manufacturing center, and being touted as the “Underwear Capital of the World,” to attracting numerous corporate headquarters and high-tech companies, Knoxville has continuously evolved its business climate to serve its people and grow the regional economy. Today, it continues to be a prime place for businesses to locate, operate and grow. Knoxville’s assets include Oak Ridge National Laboratory, Y-12 National Security Campus, and premier higher-education institutions including the University of Tennessee, making the region a playground for innovators and change-makers. The city’s business-friendly values and heritage of innovation are why companies like Jewelry Television, Regal Entertainment Group, Pilot Flying J, Clayton Homes, Bush Brothers, and Scripps Networks Interactive choose to call Knoxville home. The city offers boundless potential for business. We offer two packets of resources that provides you with everything you need to know.